The two largest opposition parties in the Dublin parliament, Fine Gael and Labour, have stunned the Irish people after they backed a plan to ensure the passage of Fianna Fail’s financial programme through the Dublin parliament. The move follows the withdrawal of the Green Party from the coalition with Fianna Fail in the wake of the resignation of Brian Cowen as Fianna Fail leader. Cowen, however, remains as Taoiseach in charge of a minority government in Dublin pending the announcement of a general election, now expected to be held in late February. With support from Labour, Fine Gael and the Greens, Fianna Fail’s Finance Bill is set to be accelerated through both houses of the Dublin parliament by the weekend. It legislates for the 2011 austerity budget as part of a four-year plan which places the costs of the state’s banking and fiscal collapse firmly on the lower and middle classes and on future generations. The bill, with its scores of amendments, is to be guillotined [cut short] in order to terminate debate in the parliament and ensure its rapid passage before the voters get their say in the election. With an effective four-party coalition now exercising power, political debate has polarised between these parties on the one hand, and Sinn Fein and other left-wing groups on the other. Incredibly, Sinn Fein’s five TDs now represent the only opposition in the Dublin parliament. Strongly opposing what they describe as a ‘grubby deal’ by the ‘consensus for cuts’, the party has come under intense political attack by all four establishment parties. Also opposing the deal is the United Left Alliance, headed by Socialist MEP Joe Higgins. The Labour Party’s change of heart has created the greatest shock. Labour’s no-confidence motion in the government, due to be debated today [Tuesday], would have led to the immediate collapse of Cowen’s regime. However, it has now been withdrawn the motion to allow the passage of the Finance Bill. After only an hour of talks yesterday, Finance Minister Brian Lenihan revealed all parliamentary business would be cleared for the week to fast-track the Finance Bill. “I think it’s a good day’s work. I think it’s important for the country that we are seen to unite,” he said. Sinn Fein said it had been invited to the talks but when it turned up, was quickly asked to leave. “I went into today’s meeting with the sole purpose of telling the other parties that Sinn Fein will not be a party to the grubby little deal to pass the Finance Bill in the dying days of this Dail,” Sinn Fein’s Finance spokesperson, Pearse Doherty, said. “There was an opportunity today for the opposition parties to bring down this government once and for all and to bring about the general election that the people are crying out for. Both Labour and Fine Gael have insisted they only decided to facilitate the Finance Bill in order to advance the general election by two weeks, a claim which has been widely ridiculed - not least because of Labour’s refusal to proceed with its ‘no confidence’ motion. A hysterical and ranting attempt to defend the Labour Party’s sudden change of heart by its Finance spokesperson, Joan Burton on Vincent Browne’s Late Show on TV3 last night created an internet sensation and became a global top-trending subject of debate on the Twitter website. Taoiseach Brian Cowen is expected to dissolve the Dail any time between Saturday and Tuesday with a general election to be held within 18-25 days, excluding Sundays and holidays. The unprecedented upheaval began with allegations over the Taoiseach’s golf and social outings with former Anglo-Irish Bank officials and the ‘golden circles’ which exist at the top of Irish society. Accusations and innuendo quickly turned into a leadership heave, which Cowen survived, only for six ministers to resign and his attempted Cabinet reshuffle ended in tatters. 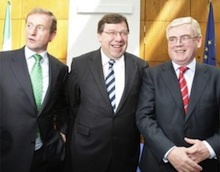 Cowen stepped down as Fianna Fail leader on Saturday afternoon but insisted he would remain Taoiseach until an election. His departure effectively forced the Greens to quit government the following day. Labour’s previously tabled no-confidence motion, which would have brought about the government’s collapse, ironically forced yesterday’s extraordinary u-turn by the main Opposition parties. The developments have now identified Sinn Fein as the only party in the Dublin parliament to genuinely oppose the government’s financial policies. They have also sharply exposed the underlying links between Labour, Fine Gael and Fianna Fail and are certain to accelerate the process of political change currently underway in the State.